Come and experience Glacier\\\'s pristine forests, alpine meadows, rugged mountains, and spectacular lakes. With over 700 miles of trails, Glacier is a hiker\\\'s paradise for adventurous visitors seeking wilderness and solitude. Relive the days of old through historic chalets, lodges, transportation, and stories of Native Americans. 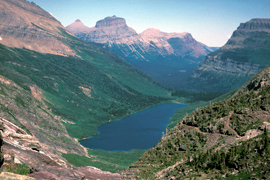 Explore Glacier National Park and discover what awaits you.